we have actually spent a lot of time doing other typical spring yard things. cleaning, planting, staring at tiny green things in anticipation. however, we have been totally mesmerized by the girls. snooki's girls. it's typical to open up a hive and check things out about once a week or so. bees under the lifted sugar water pail. good. eating. women love their sweets. we provide what's called a foundation in the frames. this is a plastic molding of the classic beehive shape we're all familiar with. bees add their own wax to this, making the cells longer and deeper. if you click on this picture you can see that the bees have started to draw out this comb. there are also eggs on this frame, but mostly impossible to see in the photo. girls on top of their busiest frame. they were calm for this inspection, which seems unseemly behavior for any jersey girl. but we'll take it. second inspection happened about a week after this. here we're checking for a couple of things. first, that the girls are gathering pollen (their protein source) and nectar (which will feed the bees and some of which will eventually become honey). pollen is in the dark cells, and nectar is the more liquid delicious filling. again, looking for eggs, but this time, also larvae and capped brood. 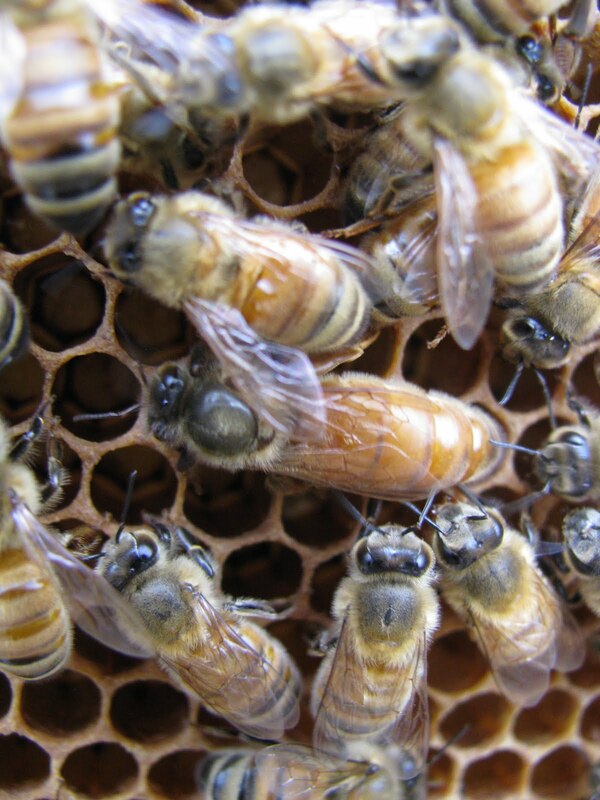 it takes 21 days for a worker bee to go from egg to larvae to bee. when larvae are ready to be capped so they can develop into bees in peace, they give off a pheromone that alerts their sisters to cover them up. girls appreciate some privacy, even if they do use bump-its. this is a great photo showing cells with larvae of various stages and covered brood. here's another image, showing empty cells from which young bees have already emerged. the first of many jobs the workers rotate through is to clean out these cells in preparation for the next egg. also, this photo shows bees of different ages. unlike us, bees darken as they age. if you look at the bee the third down from the far right side of the page, notice her cute light fuzziness. we were shocked to realize that bees, in fact, have baby faces. but what was nice about this inspection is that we're starting to calm down a bit. the bees are busy (of course), but mellow. they just keep doing their thing as we rip apart their home (without damaging, of course. like if paul bunyon ripped off the top of your house and you continued to cook dinner as he commented to babe the blue ox how cool humans were, and what little ecosystems they develop). so, that's the bees. they are awesome, and we're so glad to have them around. hopefully everything continues to go well. but this picture is from two weeks ago. things are looking much better now. and above is the arbor, where fierce oriole fights have been happening on a nightly basis. sugar-water to spray the bee package with, sugar water feeder, and pollen patty--what keeps bees going during a normal april. with the back yard in full bloom, this is not a normal april but we're keeping with protocol anyway. the package itself, around 20,000 worker bees (all females, if you didn't know), and a queen safe in her little itty bitty condo. the prepared hive, complete with entrance stuffed with grass. the grass is to inhibit the wanderlust that the bees may have after being driven a thousand miles, sprayed with sugar water, bonked around savagely a few times, and dumped unceremoniously into a fully non-furnished pre-fab home. these bees got rid of the grass in about...an hour. we unfortunately have no pictures of the queen release. this is for two reasons: she did not allow for photojournalists, and she was also incredibly feisty and all concentration was needed to be sure she didn't leave for greener hives. bees were installed thursday early evening. today, even with all the rain, many worker bees were returning to the hive with pollen on their legs. in a few days, we'll check for queen acceptance, and hope that snooki has decided to grace us with her brash italian presence. we're having bees! everybody is tired of hearing me talk about it, i know. we pick up a 2-lb package of italian honeybees (total guidos) next wednesday. we still have to paint the hive bodies, but man, it's cool to have this stuff and think about bee awesomeness in the near future. hello. let it be known that teachers in february are out of words. we don't even talk to each other, preferring to communicate via vague flailings of the wrist, barely audible groans, and occasional heavy sighs. it's just that time of year. these are the things winter is for.